IRISH LEAGUE winning manager, Stephen Baxter insists Crusaders must now follow the 'Derry City model' and go full-time. Baxter refuses to rest on his laurels after his side claimed the Gibson Cup over the weekend - his third title in four seasons. And the Crues boss believes in order to take his team onto the next level they must embrace the full-time ethos. And he pointed to League of Ireland clubs, Dundalk and Derry City as examples of how a full-time professional set-up has improved successes on the pitch and in Europe. “We have our full-time plans in place for what we are going to do next year," he said. "We have talked about it the last few years about the work these guys are putting in as part-time footballers. “That is why we have to examine things like how do we recover? What we eat? All these things and other things have to be looked at. 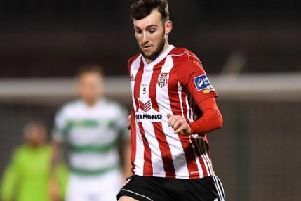 And Baxter says many teams in the Irish League will up their games in the coming seasons with the introduction of more 3G surfaces like those at Brandywell Stadium, Oriel Park and Seaview. “I think teams like Coleraine and Ballymena United will look at getting plastic pitches in and it will improve the level of our football. “You cannot play good football on muddy pitches that have turned into mud baths. “The league has improved ten-fold and I believe that it is good for the game to see the likes of Coleraine and Cliftonville doing well and I hope to see the re-emergence of Glentoran. “The level and standard of our football is improving and we have to keep on heading in the right direction,” added the Crusaders boss.